Having a freshwater fish tank or aquarium is a wonderful thing to own. Wether you live alone or have a family, adding freshwater fish to your household can bring both beauty and joy. Freshwater fish, also known as tropical fish, are beautiful creatures that will brighten up your day just watching them for a few minutes. They can bring you calm and peacefulness, and will be admired by any visitor. Keeping freshwater fish is not a hard feat, but does take some practice. Patience along with providing the correct environment for your freshwater aquarium is half the battle. The other half is ensuring they are kept healthy and stress free. The majority of that can be attributed to their diets. 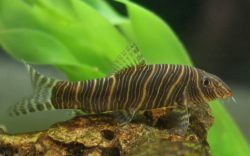 There are many different kinds of freshwater species and depending on your tank or aquarium setup, you might have as little as just a handful or as many as dozens. 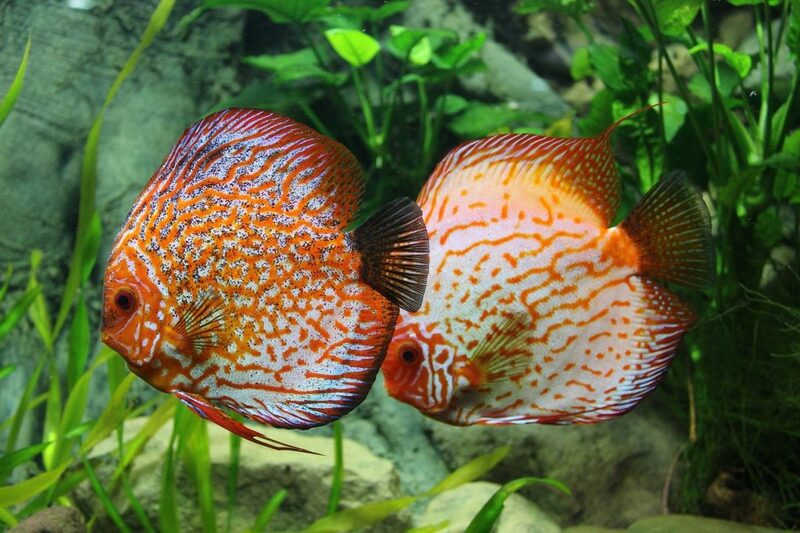 There are many different varieties of freshwater and tropical fish. Some of those varieties include: Betta Fish, Discus, Tetras, Guppies, Danios, Angelfish, Cichlids, Catfish, and many more. This food list does not include Betta fish, instead we have a separate guide just for them. This list however will cover most all other freshwater species. While all of your freshwater fish can eat the same food, each will have their advantages and disadvantages. If you plan to have a tank with freshwater fish that mostly feed from one zone; top, middle, or bottom, then you can pick one of the best freshwater and tropical fish foods listed below and stick with it. However, if you have a good mixture of top feeders, middle feeders, and bottom feeders, we recommend a combination of the foods listed. Using a combination ensures all of your fish get fed and there will be little waste, meaning less cleanup! Below you will find a list of the 12 best freshwater fish foods. 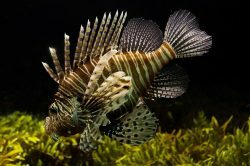 12 is normally too many options for any one person to choose from, but we have broken it up by the different feeding and living zones of your tropical fish. This should make it easier to choose from one feeding zone or as we recommend it, choose a combination from multiple zones which help to meet the needs of all of your fish. We have included general information about the food and cover different aspects that will hopefully help you choose the best food for your situation. Lastly, we highlight advantages and disadvantages of each. TetraMin Tropical Flakes is the first tropical fish food on our list of list of the best. These flakes are packed with vitamins in their patented ProCare formula to help support your fish’s immune system and are packed with a nutrient rich mix that offer a nutritionally balanced diet. The flakes also include Biotin to effectively manage their metabolism and Omega-3 fatty acids for growth and energy. This food will also help to bring out the natural beauty and color of your beautiful fish. TetraMin Tropical Flakes are produced by the well known brand with many quality products in the industry. Tetra prides themselves on their fish food and other products, and offer high quality ingredients that provide everything needed to ensure your fish stay at their optimum health and live long stress free lives. Since these are flakes, they will not cloud the water like other types of food. They flakes are also different sizes which allow them to sink at different rates. That ensures that all of your fish community will be able to feed at the level they like, from eating off the surface to the bottom feeders. TetraColor Tropical Flakes are designed and developed to promote the natural and beautiful color in all of your tropical fish. Packed with nutrients and vitamins including Vitamin C and Omega-3 Fatty acids. These flakes deliver a precise dose of the needed daily nutrients for your fish and give them energy while helping to promote good natural growth. These Flakes are similar to the TetraMin flakes in number 1, but they really work to give an extra boost to their bright natural color, hence the name TetraColor. If your fish seem to not be as bright as they used to be, you definitely want to add these flakes to their diet. TetraColor Tropical Flakes can be given to as a daily diet or even better they can be fed in conjunction with the food listed first on this list, TetraMin Tropical Flakes. Feeding them in conjunction will truly promote a staple diet and really bring out the best of your fish from their health to natural color. As with other flakes, these will not cloud the tank water and they will sink at different rates ensuring all your fish are fed. Trust Tetra with their products and your fish will love you, they deserve only the best. 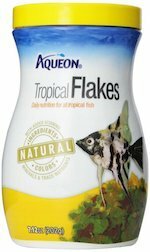 Aqueon Tropical Flakes are formulated with all natural ingredients and colors, one of the only foods that really do only use natural ingredients. With added trace nutrients, minerals, and vitamins, these flakes provide a well rounded and healthy diet for your freshwater fish. These flakes provide a balanced nutrition for daily feeding. Thanks to the natural ingredients, this freshwater food helps your fish to utilize all the nutritional value of the flakes and aids in creating less waste overall. Aqueon Tropical Flakes provides the nutritional building blocks needed and provides a healthy daily diet. They will also help bring out the natural color and beauty of your freshwater fish and give your little friends extra energy, all while keeping them healthy and extending their lives. Aqueon prides themselves on using only premium and natural ingredients. If you are looking for the best freshwater food with all natural ingredients, this should be your top choice. Since these are flakes, they will not cloud your tank or aquarium and will also sink at different rates which will feed all your different kinds of tropical fish. However, do note that these flakes are tiny and not the typical size of other flakes, which is more than likely due to using natural ingredients. Omega One Freshwater Flakes are a great food option if you are seeking flakes that offer all natural ingredients. These flakes offer an abundance of fresh seafood proteins and a variety of natural fatty acids including Omega 3 and 6. The inclusion of fatty acids help their immune system which leads to long healthy lives. Also included in the recipe are natural salmon skin pigments witch work to enhance the vibrant and natural colors of you tropical little friends. Omega One Freshwater Flakes are suitable for all your freshwater varieties. The flakes will first float on the surface and then sink slowly which allows all of your fish at each level, top, middle, and bottom, to feed and enjoy. These flakes will not cloud the water either. TetraColor Plus Tropical Flakes are very similar to the TetraColor Tropical Flakes, but have added ingredients to brighten up your freshwater fish even more. They are nutritionally balanced with nutrients and vitamins that are great for daily diets. These flakes give you fish everything they need to live long healthy lives and give them added energy and maximum beauty. If your fish seem to have lost color and are not as bright as they used to be, you can switch permanently or temporarily to TetraColor Plus Tropical Flakes to help bring out their amazing natural color and beauty. This is especially true for species that are red, orange, and pink colored and hue, as the color enhancing ingredients seem to help boots their color the most. It will help the colors of your other fish, but might not be as big of a contrast. As with other flakes, these will not cloud the water and will sink at different rates. Omega One Super Color Flakes offer a good natural freshwater food option if your fish need some extra help bringing out their natural color. The ingredients in these flakes include real fresh seafood protein, natural fatty acids including Omega 3 and 6, and salmon skin pigments. The key to the color enhancement in this product is the salmon skins which contain beta-carotene pigments. Those pigments transfer to the skin of your fish and enhance the color and bring out their natural beauty. Omega One Super Color Flakes is offered by a good company that produce products with some of the best ingredients on the market. Their products are all natural and you can’t go wrong with them. Your fish will love these flakes and look great too. The flakes will sink slowly and feed your little friends at different levels on your tank or aquarium, and won’t cloud the water. TetraMin Tropical Crisps offer another alternative, like granules, to all the flake options and varieties. While flakes are the most popular, crisps will float longer and sink slower to help your top and middle feeders. Crisps are best if the majority of your fish are mid to top feeders or if you have lazy fish that don’t like to chase fast sinking food. If you have bottom feeders, they will still get their food it will just take a bit longer for it to reach them, or you could mix this food with the TetraColor Tropical Granules for the best of both worlds, that will feed all of your fish at their respective feeding levels. TetraMin Tropical Crisps are high in nutrition and offer healthy and easily digestible protein, carbohydrates, and vitamins. The mixture of ingredients provides your community with a good balanced diet and provides energy and simulates rich color. Crisps also produce less waste which aid in keeping your tank or aquarium water clean and clear. Omega One Freeze Dried Blood Worms are good as either a daily diet or are even better as a treat one to three times a week. They will love it and appreciate the small treat every time. The blood worms offer a high protein content and color enhancing properties. These are freeze dried which helps maintain the nutritional value of the blood worms, giving your fish all the right vitamins and minerals for extra energy and a healthy immune system. Blood worms are a good choice for all freshwater varieties and offer a high protein daily diet or treat. Omega One Freeze Dried Blood Worms are only made of blood worms and do not include insect larvae which means that you should not have an allergic reaction to them like the Tetra brand. As always, please read the label to make sure the ingredients have not changed since the publishing of this article. They tend to float for a while so are better for top feeders, but will eventually sink for you other fish. A combination with another form of food is the best way to utilize blood worms. Tetra Blood worms are another good alternative for you freshwater fish. Bloodworms can be used as a main diet or even better they can be given as treats along side another food option. They can be great as a treat given one to three times a week and your fish will love you for it. The blood worms are freeze dried which help retain all of their flavor and the maximum amount of nutrition possible. They offer vitamins and minerals which give them extra energy and a healthy immune system. The size of the freeze dried blood worms also help you give the right amount of food. They won’t cloud the water in your tank or aquarium. Tetra blood worms have one major issue to be aware of. They have been known to give allergic reactions to some people. The allergic reaction stems from the insect larvae found in the ingredients. If you are going to try these but are worried, use gloves as a precaution. As with the other blood worms, these are good for top feeders as they take a while to sink, but will eventually. The bottle cap can be a little tricky so be careful not to get them everywhere when you open it. TetraColor Tropical Granules offer an alternative tropical food to all the different flake varieties. While flakes are the most popular, granules offer bite-sized morsels that will sink faster and reach all the different species in your tank or aquarium, especially bottom and mid-water feeders. Granules are best if most of your fish are mid or bottom feeders, or you have fish that enjoy chasing their food. If you have a good number of top feeders or lazy fish, this might not be the best type of food for your freshwater community. These granules in combination with TetraMin Tropical Crisps make a great daily diet if you would like to stay away from flakes but have a good mix of all types of fish at different levels in your tank or aquarium. TetraColor Tropical Granules are highly nutritious and are a great diet for the specific types mentioned above. They provide a high protein diet with added Vitamin C which help with digestion. The granules are micro milled with leads to less waste and clean water. This food also offers color enhancing properties, which help to bring out the natural color and beauty. Aqueon Shrimp Pellets offer yet another food type for your tropical fish. Shrimp pellets provide a balanced daily diet with all the nutritional properties your little friends need. They are highly digestible and give your fish extra energy and will make them healthy and happy. Developed with premium ingredients, Aqueon uses only natural ingredients. There are also no artificial colors so you know they are the real deal, despite the actual pellet color. These pellets can be used for both tropical and saltwater varieties. Aqueon Shrimp Pellets will sink fast making them best if you have a tank or aquarium with a lot of bottom feeders. They are quite large, so might be best for medium to big varieties, but should work for most regardless. Combine these with a top floating or slow sinking food, crisps or flakes, for optimal feeding of your community. These are especially good for loaches and catfish. One issue with these is that they tend to dissolve quicker compared to flakes and other non-pellet type foods. Make sure not to over feed or you will have cloudy water. Wardley Shrimp Pellets are another great option if you are looking for a good brand of shrimp pellets for your freshwater fish. 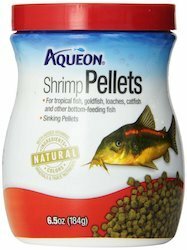 As with Aqueon’s shrimp pellets, these offer a good blend of nutritional ingredients that can be used as a daily diet for your tropical fish. These pellets will sink and are ideal for bottom feeders including loaches and catfish. The pellets are quite large which makes them better for medium to large varieties, but will work for most sizes. They are also good for feeding larger fish like cichlids and oscars. Wardley Shrimp Pellets don’t offer the same natural ingredients as Aqueon, which is one of the major differences. They are still a good product and company, they are just made differently with some differing ingredients. These pellets, like the Aqueon, will also break apart quicker compared to other food on this list. If you overfeed you could end up with cloudy water. Combined with slow sinking fish food, crisps or flakes, and you have a good all-round daily diet for all of your freshwater fish. While this guides offers a lot of different options, we hope that it helps you to pick the best freshwater fish food for your community. Fish are sensitive and fragile little creatures, but with the right care and food they will live long healthy lives and give you the enjoyment and tranquility you are looking for. Feel free to comment below and let us know which food you use or if you have any other opinions. Thanks for reading!